Built in 1985, Peter Estin Hut was the third publicly funded hut added to the 10th Mountain system. Funds were donated by the Estin family in memory of Peter Estin. If you have used other "standard" 10th Mountain Division Huts, the Peter Estin will look familiar. It stands two stories high with a commodious deck jutting from the front door. Plenty of glass faces the south views. Layout and capacity: 4 single beds downstairs, 2 private bedrooms upstairs with one double bed each, plus 8 beds in a communal sleeping area upstairs. Capacity 16. The most common route into the Peter Estin hut is via the Ironedge Trail which begins near Yeoman Park. The first part of the trail follows a snow covered road up to the Fulford Cave campground, which is closed during the winter. From there you follow the Ironedge trail as it climbs steeply up to the hut. In the summertime you can access the Peter Estin Hut by hiking up the Ironedge trail or by driving in from either Sylvan Lake or Yeoman Park to the designated parking area approximately 1/4 mile from the hut. You can also drive in from the Fryingpan River Road on FS 400 and FS 416 but be aware that FS 400 can be very slick and dangerous when wet so watch the weather if you are planning on using it to access the hut. Vehicle access is never guaranteed to any hut at any time. 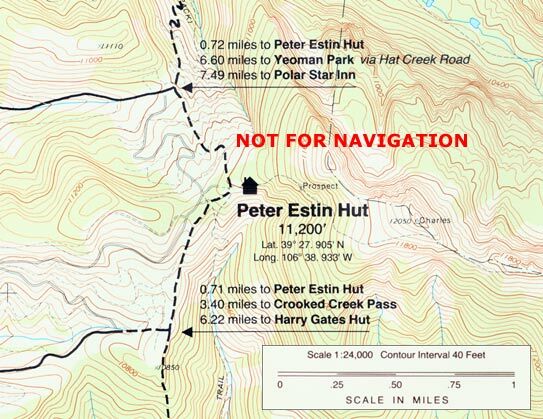 There are numerous hiking options around the Peter Estin Hut. You can follow the trail along the ridge towards Charles Peak or drop down toward Mystic Island Lake. For a long day of hiking you can drop down from the top of Charles Peak towards Woods Lake as well.